Understand your daily fitness and sleep patterns. 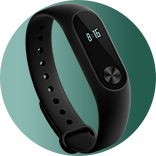 [Q&A] Mi Band to get HPB tracker qualifications? [Discussion] 10000 Steps A Day? [Q&A] Can Xiaomi Band 3 be charged with Band 2's charging cable? [Discussion] Is Mi Band only a fitness tracker? [Discussion] Mi Band 3 VS Mi Band 2, Should you upgrade your Band 2? [Q&A] When will MI band 3 come to Singapore? [Q&A] mi band 3 support English version or not?